Use the Chief CMS-060 Speed-Connect Fixed Extension Column to lower your projector or flat panel display an additional 60" (152.4cm) from the ceiling. This column also provides flow-through cable management with a cable exit port for a clean installation. Use in combination with any 1.5" NPT ceiling plate or other accessory. Consists of 1.5" NPT column threaded on both ends. Aluminum construction makes installation easy and saves on shipping costs. Weight capacity is 500 lbs. 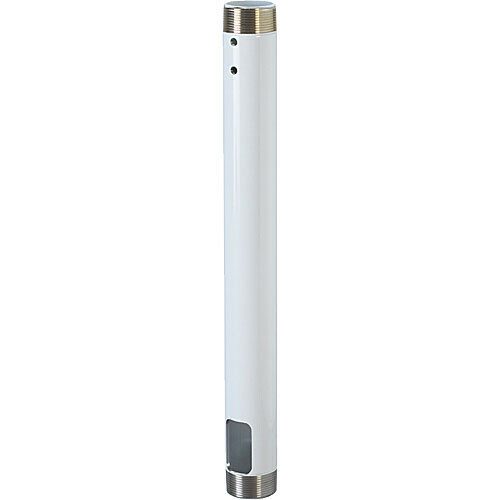 Box Dimensions (LxWxH) 63.0 x 2.3 x 2.3"
CMS-060W 60-inch Speed-Connect Fixed Extension Column (White) is rated 5.0 out of 5 by 1. Rated 5 out of 5 by J. Winn Sound from Convenient, lightweight, good looking. I used to get black gas pipe and have it threaded, then paint it if necessary. These are so much easier and better looking. The lighter weight also makes them worth the extra cost.